Yesterday, I shared how Jen, Trash To Treasure Diva, and I did a little baking for holiday gifts. Today, I wanted to share with you the finished result. 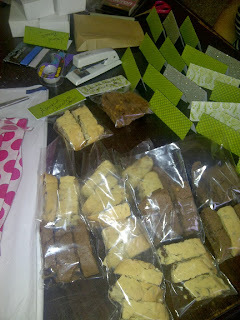 You saw the yummy Biscotti we baked, now it's time to pull out some card stock and plastic candy bags and do some packaging. 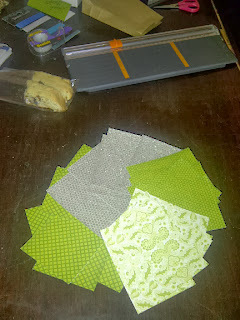 These green and silver pieces came from a DCWV mini stack. The pages measured 4.5" x 6.5" so we cut them in half and folded them to create the flaps of the packages. Jen, has much better handwriting then I do, so I offered to do the bag filling if she did the writing. We make a great creative team when we work together. All that Biscotti, and right now it's on top of my fridge away from temptation, else it may not make it to the teachers, clients, and co-workers it was intended for! Now that is a lot of biscotti! We made up small boxes for the kids' teachers and brown sacks filled with biscotti for family members. These most definately are the right size for stocking stuffers or just making someone's day this holiday season. Don't go away, Tomorrow we're heading into the third day of the Twelve Days of Christmas, and I think you'll find what we're brewing up to be just as delicious as this yummy bicotti.